NASA’s Jupiter-orbiting Juno spacecraft hasn’t been able to catch a break lately. This past October, Juno suffered a malfunction with a pair of helium valves, causing NASA to delay an engine burn that would have brought the spacecraft into its “science orbit.” Today, after months of evaluation, NASA announced that it has decided to forgo that engine burn entirely. Juno will remain in its current 53.5-day orbit for the rest of its mission, which isn’t the worst news, but it’s not great either. 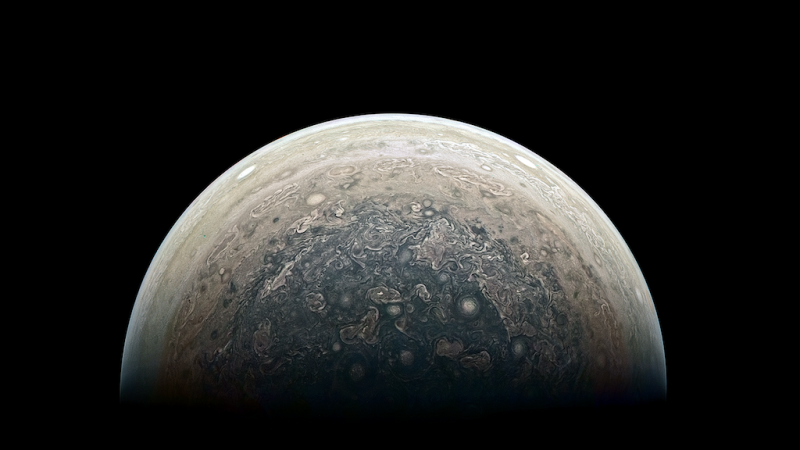 Initially, Juno was supposed to have 33 science orbits, swooping low over Jupiter’s cloud tops every 14 days to collect data on the gas giant’s magnetic field and interior composition. Though NASA is putting on a good face about the “bonus science” a wider orbit will afford, in actuality, this reduces the number of high quality data collection orbits the spacecraft is guaranteed. Juno will now get 12 science orbits under its current budget plan, which takes the spacecraft through to July 2018—although the team can ask for a mission extension. There is NOTHING bonus about that. Longer orbits could also pose some issues for down the line. As Gizmodo previously reported, if Juno remains in this extended orbit into 2019, it’ll run into eclipse issues, passing through Jupiter’s shadow for several hours in each orbit. Since Juno is solar-charged, this could cause power outages. Despite all this, NASA has decided to put a smile on to mask the internal screaming.